Ex Ex Vee Eye Eye Eye — Hike! 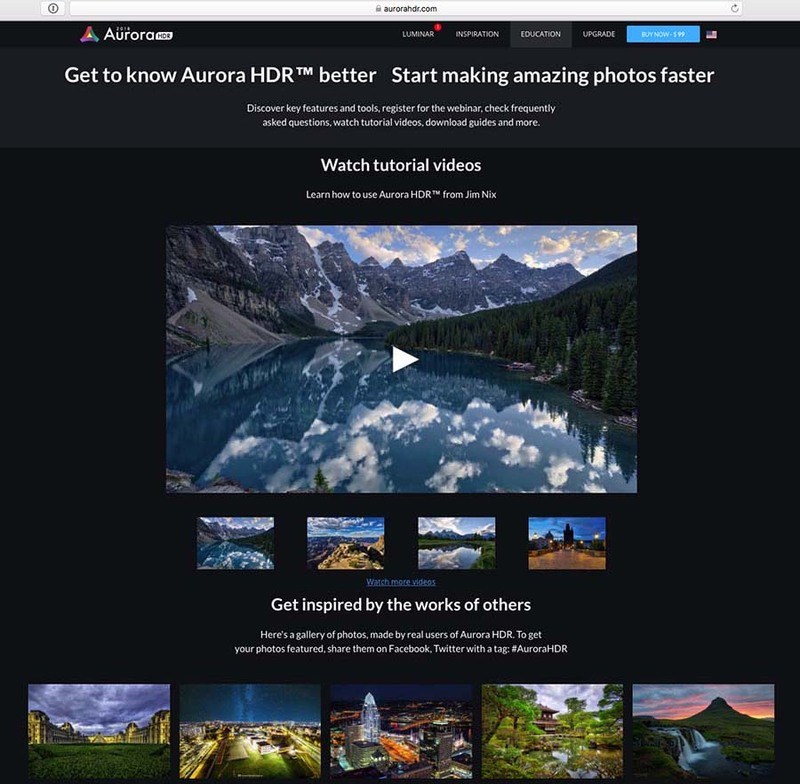 The software is Aurora HDR 2018 and you can learn more about it than even my review gives you at www.aurorahdr.com. There you can also download a trial version and, if you're interested in purchasing it, use the promo code allthings, just like that, allthings, to get $10 off the regular price of $99. First, though, here are some examples of images created using Aurora 2018 and the visible rationale for doing so. 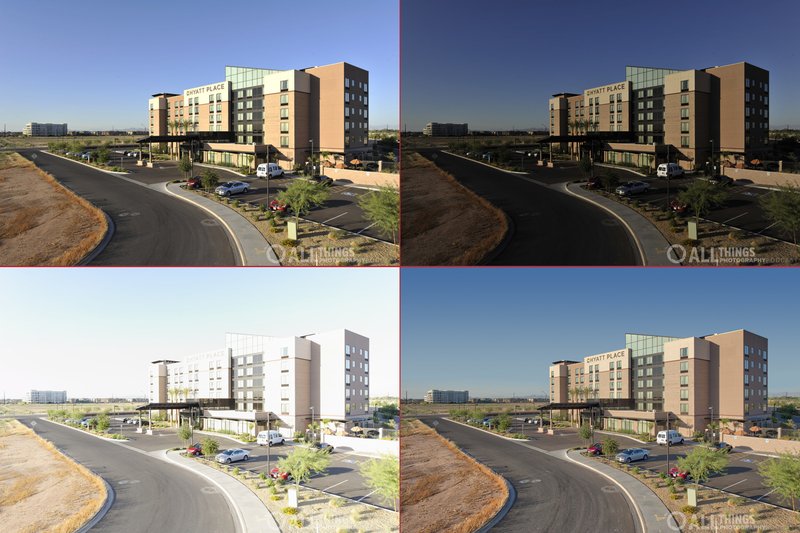 Obviously, the image in the lower right quadrant is the HDR example, while the other three are the "normal," darkest, and brightest exposures made. The first two sets are also examples, in their final images, of fairly realistic treatments. Bright sunlight, even late in the afternoon as it shone on this newly constructed Hyatt Place, challenges the viewer to see the beauty, calm, attractiveness of the facility — the harsh shadows don't scream "WELCOME HOME!" Or, rather, perhaps that's just what they are doing; screaming. The HDR in the bottom right is definitely more welcoming. The contrasts are muted, the colors just a bit brighter. One might think that overcast skies would provide soft, even, lighting. 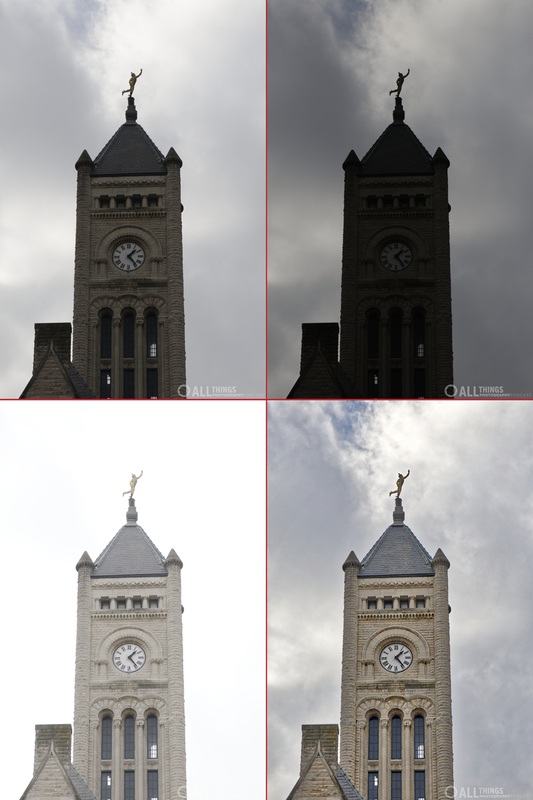 One might be wrong, of course, as evident in this series of the Union Station clock tower in Nashville, Tennessee. Notice how the "normal" exposure in the upper left has the building too dark, though the clouds are reasonable. The dark exposure has even more dynamic clouds but the building is a mere silhouette, and the bright exposure reveals all the latent detail but the contrast is milky and the sky is gone, gone, gone. Mash 'em all together in Aurora HDR 2018 and you create a much more interesting image to contemplate. Notice that the final HDR is similar to the "normal" shot in the upper left, in terms of the cactus itself, though even there the HDR version holds more detail in the shaded areas and a bit more contrast throughout and by going through HDR, using the other exposures, the ground, the mountains, and the sky are all much more interesting. This is only a little over-the-top, and totally acceptable if this is the desired result. 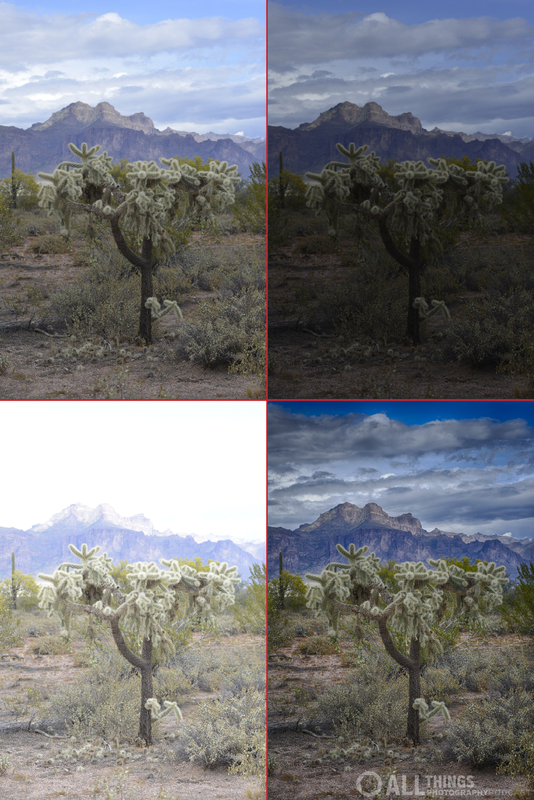 These show the subtle reasons for using HDR. The brightest image, in the lower left, is almost good enough, but not quite. It's difficult to see at this size, but there is no detail in the tips of the fuzzy things inside the near blossom (pistils? stamens?). Plus, some of the petals have lost all their detail and, especially the petals at the top center of the frame, on the farther blossom, draw my eye up there even though the payoff is detail-free glare. The "normal" is a bit dreary, but the final brings together color and detail and contrast worth sharing. Here are six images processed through Aurora HDR, the upper left version being the default that was presented when I first opened the five original files into the application. The others show some of the range available in the presets. If you think a couple are identical (I'm looking at you three on the left), you need just look a bit more carefully to note the subtleties between them, subtleties that are available through the 80+ adjustable attributes, which they call filters. Here are the five original exposures, for your viewing pleasure. The "normal" exposure, in the middle, seems similar to the finals — in a way, this is to be expected, since the normal exposure is meant to be as good as can be got. 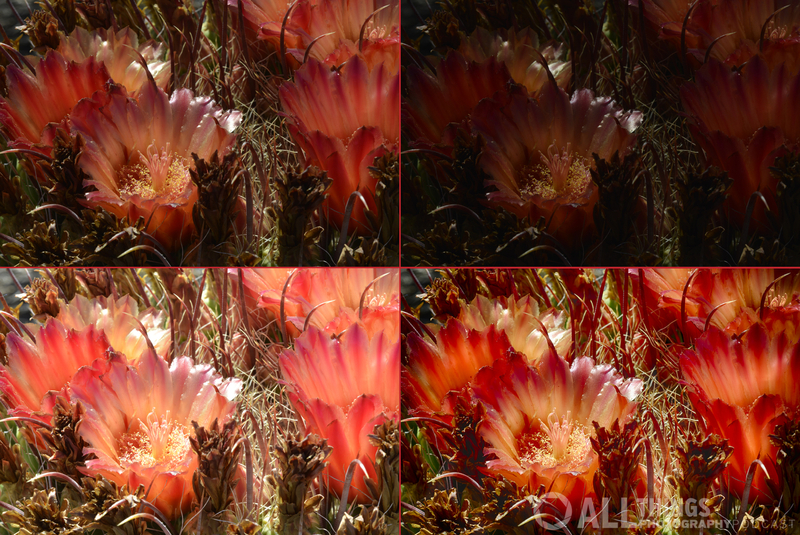 It is by using the darker and brighter versions, though, that detail is made available throughout. 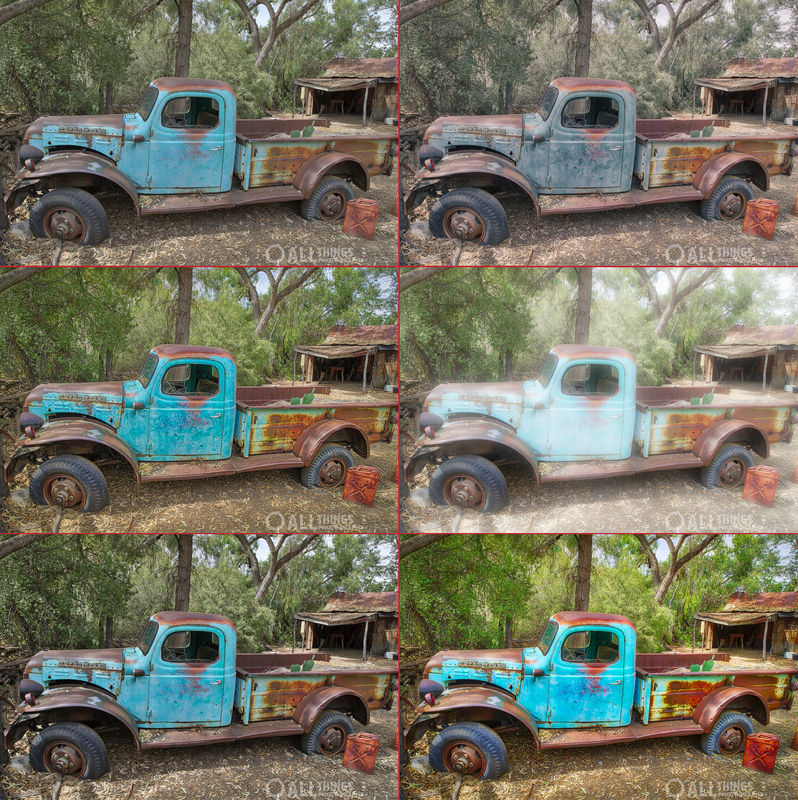 A big plus, by the way, is that each of these Power Wagon images was created and exported from a single session — I would export a version then choose another preset and export a version and on and on. In other applications I use, each version would require me starting from scratch, opening the original files and processing them just to get to the point of making revisions. Also, with Aurora HDR, I have saved the processed file, which is not the same as exporting a viewable version, and I can open the file again to make more changes without dealing, again, with the originals. I can even save the file with the history of my changes so, even after closing and opening the file, I can Undo my way through my previous work. Sweet! 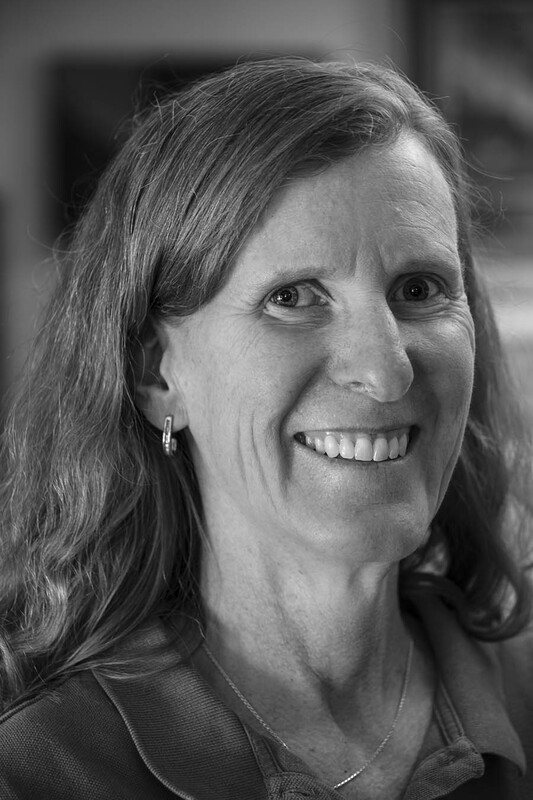 My guest in this episode is former OBGYN Rebecca Wilks, a talented and successful photographer whose work you might have seen in Arizona Highways magazine and its calendars, among other outlets. You can see her work, any time you want, at her web site, skylineimages.net. We also mention an organization called Through Each Other's Eyes, and you can learn more about them at teoe.org. Doctor Rebecca Wilks. Photo by Rebecca Wilks.